We are Goddes stewards all, nete of oure owne we bare. Thomas Chatterton (20 November 1752 – 24 August 1770) was an English poet and literary forger, claimed by some as the father of English Romantic poetry. He is best known for his verses in pseudo-medieval English, which he claimed were by a hitherto unknown 15th century poet called Thomas Rowley. He died, either by suicide or by accidental overdose, at the age of 17. Bere mee to yer leathalle tyde. I die; I comme; mie true love waytes. Thos the damselle spake, and dyed. Ælla; a Tragycal Enterlude, "Mynstrelles Songe", line 54. "A Hymn for Christmas Day", line 1. "A Hymn for Christmas Day", line 13. Reason, a thorn in Revelation’s side. Haste to thie kiste, thie onlie dortoure bedde. Knightis and Barons live for pleasure and themselves. And the hot fierie smothe in the wide lowings dies. And the full cloudes are braste attenes in stonen showers. The sleepless soul that perished in his pride. William Wordsworth, "Resolution and Independence" (1802) line 43. He was an instance that a complete genius and a complete rogue can be formed before a man is of age. Horace Walpole, letter to William Mason dated July 24, 1778; published in Horace Walpole (ed. William Hadley) Selected Letters (London: Everyman's Library, 1963) p. 191. I cannot find in Chatterton's works any thing so extraordinary as the age at which they were written. They have a facility, vigour, and knowledge, which were prodigious in a boy of sixteen, but which would not have been so in a boy of twenty. He did not show extraordinary powers of genius, but extraordinary precocity. Nor do I believe he would have written better, had he lived. He knew this himself, or he would have lived. Great geniuses, like great kings, have too much to think of to kill themselves. William Hazlitt Lectures on the English Poets (Philadelphia: Thomas Dobson, 1818) p. 243. 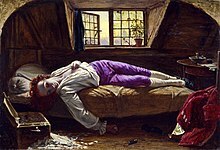 O Chatterton! that thou wert yet alive! Hanging, enraptur'd, on thy stately song! All deftly mask'd, as hoar Antiquity. Samuel Taylor Coleridge "Monody on the Death of Chatterton" (1794) line 126. The finest of the Rowley poems – Eclogues, Ballad of Charity &c rank absolutely with the finest poetry in the language…He was an absolute and untarnished hero. Dante Gabriel Rossetti, letter to Hall Caine dated June 13, 1880; published in Vivien Allen (ed.) Dear Mr. Rossetti (Sheffield: Sheffield Academic Press, 2000) p. 122. This is the most extraordinary young man that has encountered my knowledge. It is wonderful how the whelp has written such things. Samuel Johnson, April 29, 1776; reported by James Boswell, Life of Johnson (Oxford: Oxford University Press, 1989) p. 752. This page was last edited on 29 September 2015, at 14:10.